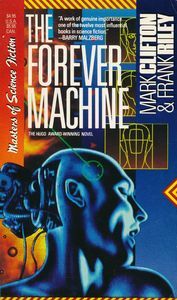 In a better world, I would be able to discuss The Forever Machine more substantially than simply describing it as “the most forgettable novel to ever win the Hugo Award”. Compared to other great Science Fiction novels honoured by a Hugo, Mark Clifton and Frank Riley’s They’d Rather be Right (which formed the basis for the slightly-reworked Forever Machine) simply doesn’t sustain comparison. Even looking at its 1954 contemporaries, you get classics like Mission of Gravity, The Caves of Steel, Double Star, Childhood’s End, The Space Merchants, Fahrenheit 451… a good chunk of essential reading for the dedicated SF fan. But let the past remain the past and consider The Forever Machine as a novel sealed in a time capsule and sent in the future by fifties fandom as a novel they thought would be worth a read by their descendants. 56 years later, what do we have? As seen from today’s perspective, the efforts to build a really big computer and then feed it all known facts to create an emergent AI (dubbed “Bossy”) are kind of amusing. (But then again, we did the same, called it “Google” and mostly use it for entertainment.) Where the story gets a little bit crazier is when Bossy figures out how to rejuvenate a test subject. (“My instructions, regarding therapy, were to find all tensions of any nature, and remove them” [P.176] says the computer.) From Artificial Intelligence, the novel turns into a consideration of immortality… but only if you can make it past the unselfconscious sexism that permeates the novel alongside mentions of cable cars, and plastic tape for data storage. The universe of the novel is one where fathers “thrash” their misbehaving kids, women are either housewives or secretaries, and “public opinion” is basically what a mass of white middle-aged male house-owners think. The rejuvenated character of Mabel is treated in a patronizing way that shows the infantilization of women at the time. Against that background, a story of emergent singularity (have a telepath invent an AI, and immortality for all soon follows!) definitely seems strange, maybe sufficiently so to still warrant a trip to Fifties middle-class America. But I’ll stop short of leveraging this back-handed compliment into a recommendation. While there are interesting little bits here and there in the narrative, the entire novel is almost perfectly forgettable. It dissipates quickly after completion, to the point where you’d be challenged to come up with specifics only days after reading it. This is my second encounter with the novel (which I first read in 1999), and I remembered little of the previous attempt; I don’t expect to remember much of it when/if I read it again, and the lack of substance in this review will, I hope, serve as a warning to my future-self contemplating a re-read. When I started systematically reading all Hugo-winning novels in the mid-nineties, it took me years to find a copy of They’d Rather be Right, and even then it was loaned to me for a few hours during a science-fiction convention. Now, thanks to the internet, the book isn’t as hard to find as it once was. Furthermore, every few years, a publisher figures out that this is one of the few Hugo-winning novels to be out of print and reprints it. So, even ignoring that illegal copies are available only a Google search away, there isn’t much of an excuse for being unable to find the novel. Whether you’d want to read it as more than an exercise in list-checking is something I will leave to others to decide… despite my hearty endorsement of list-checking.